We are travelling to Amsterdam in May. We have been there there several times before, and are now looking for a walking tour in the countryside and not in the big city. Yes, there are walking tours, with guides, in the countryside, but I am not sure those are what you want. Mostly they are meant to show people the local nature reserve and do relatively few miles with a lot of (Dutch language) explanations. There are also loads of unguided walks, from a single kilometer to multi-day walks that take up to over a week to complete. This site has a list of them including the Pieterpad which likely is the most famous of those. From Amsterdam Centraal station you can easily reach the dunes, at station Santpoort Noord you can pick up the description of the walk at the riding school just outside the station. From there is a short walk to the start of the dunes there are signs to follow. At the entrance to the dunes you have several options for walks, if memory serves me from about 2 to 10 km, but the nature reserve also allows much longer walks. You can join the coastal walk that runs all along the North Sea coast. Those are marked by white-red squares, which can be found on trees and little posts but also on lamp posts and traffic signs where those are in the right spots. 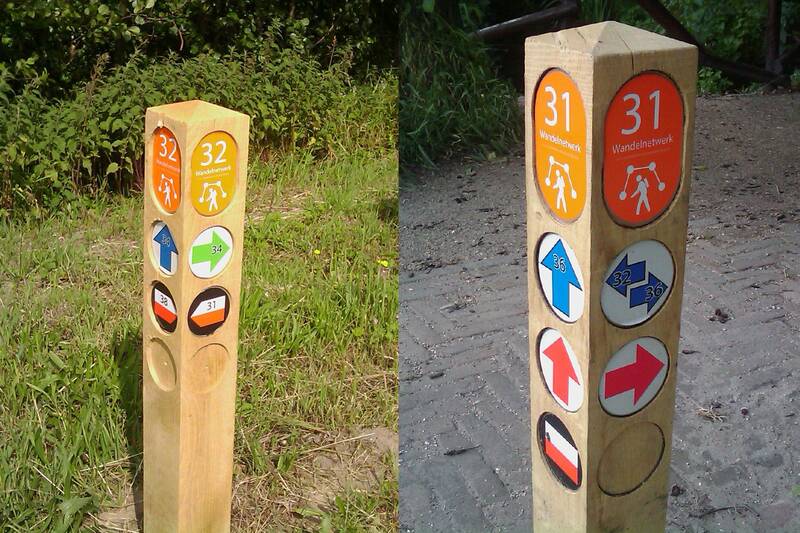 This site shows a round walk from Santpoort Noord, with a map, from the same entrance to the dunes shorter round walks are signposted with coloured markers. While this site shows a walk from Santpoort Noord to Zandvoort or alternatively Overveen, again the railway stations. And the site allows you to download maps and routes. This is a part of the map at the entrance to the dunes, as I took a photo when about to take a walk and did not carry a paper map. All entrances to the dunes have boards with a map and on that there are walks, which can also be found in the dunes as post with a colored marker. Most wooded areas and nature reserves of other nature also have that or at least some way to chose a walk within the area. With your camera or phone you can take a photo of that board with walks, so you can look back at the details later on when you are in the walk, on the screen of your camera or phone. 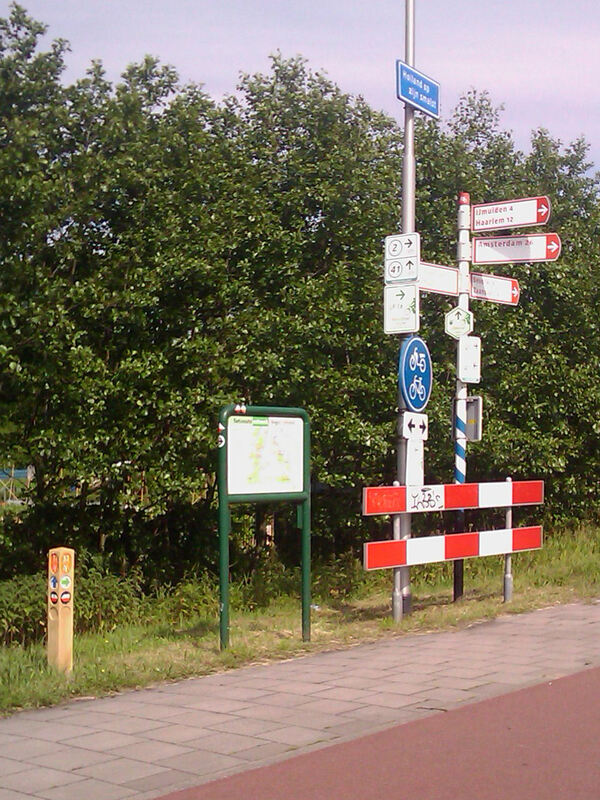 While the most used way to explore the Netherlands is by bicycle, there are many options for self guided walks. And in most cases you can also use bicycle tour routes, as they often have walking options besides the paths and you can use the paths when they are out of the build up areas. Just remember that you are guest on a cycle track and should keep to the side as you would on a road, not spread out over the path as you might do on a walking only path. Not all the routes did fit in this collection, on the lamp post behind the camera are two more, different, ones. Walking and cycling routes and a map. At this time there is a new network rolled out over the Netherlands, a nodal system of walking routes, called knooppunten netwerk in Dutch. This is a site to the network for one province, which is now fully covered but still rather new. Here is a link to a national site, with a planner for the whole of the country, not all areas will have the same system of coloured arrows but there will only be small differences. It works that you look at a map for the area you want to walk, make a list of the 'knooppunten' that you want to use. When out walking you find your first node, look at its post/markers for the colour to indicating the next node and follow that colour arrow till you get to the next node, from there you may have to follow a different colour of arrow, to avoid confusion between routes in the same area. The arrows can be found on lamp posts, low markers or other suitable places, near every street corner and at the start of paths. Other area might be using signs with numbers rather than colours on the lamps posts. Two of the walking markers, numbers next to each other and only a few minutes walk away from each other. Besides making your own routes you can follow routes others have made already, on the site I checked it on those were themed and you would select one based on location as well as theme. As the scheme is being rolled out right now, you will find more information as time progresses, I assume English information will be added at some time, as it is usual in the Netherlands and Belgium (where they also have the scheme.) 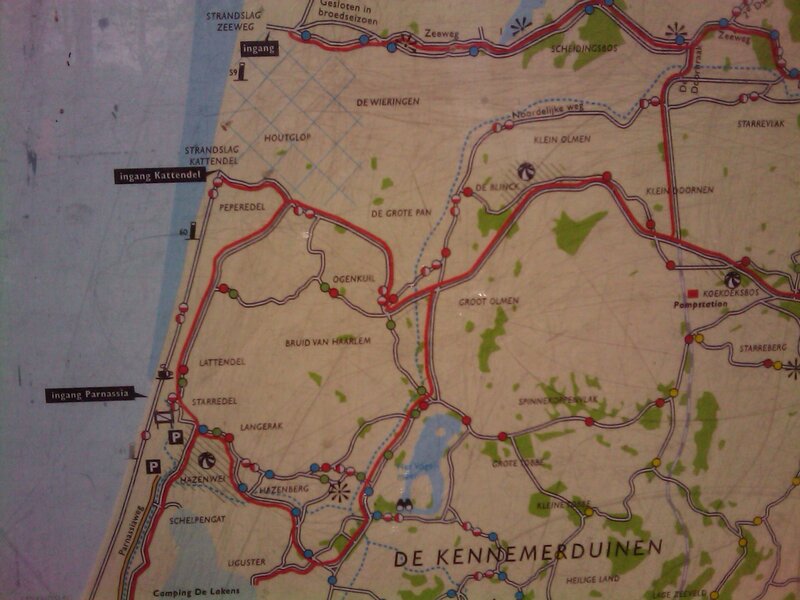 The site now covers a lot of more of the province but still only in Dutch, not yet geared to tourists. The signs in the land are not language related so you can use them once you have found where you want to walk. There might be guided walking tours for tourists even though I am not aware of them. Your best bet (I think) is contacting one of the tourist information offices, locally known as VVV. All photos in this answer are by Willeke and can be used for non-commercial uses. Since you presumably won't have a car, you might be particularly interested in the so-called “NS-wandelingen”. Those are one or two-day walks signposted by the national railway company and designed to be easily accessible by public transport or to link two railway stations. There is a list on eropuit.nl (one of the sites mentioned by Willeke). In the vicinity of Amsterdam, you could also consider going to the Beemster area. It's probably not as popular as some other places but it's a good way to get a feeling for the way culture and civil engineering have shaped the Dutch landscape. Not the answer you're looking for? Browse other questions tagged tours netherlands walking or ask your own question.